If you’re looking for a vital travel guide that accompany you during tour or travel journey in your iPhone, iPod touch or iPad anywhere in the world, the free SpotWorld iOS mobile app might be the one you seeking for. SpotWorld is a free travel app with a focus on social networking that allows users to discover the not to be missed travel spots, share own travels, and interact with community-generated itineraries, anywhere worldwide. View the interactive multimedia contents (like photos, audio readings and text articles) about more than 500,000 hot spots around the world. Spots Near Me allows users to check their nearby interesting spots. Check in and share your personal travel experience including itinerary by uploading photos, tips and ratings to SpotWorld. Explorer popular itineraries published and liked by other SpotWorld users to check the fun, interesting and top destinations that highly recommended by the community. Know popular spots that frequently visited and viewed by the SpotWorld community. Mark your presence by “Checking In” or “Been Theres” to share your current location and visited desirable spots with friends and family. Premium content via in-app purchase that unlock content written and spoken by a local expert. SpotWorld travel game to collect flags and SpotMiles on first-time check-in, and gain level up on more flags for the city. The spots that already been in the SpotWorld app is surprisingly comprehensive, considering that it’s a new app. Most of current data is extracted from Wikipedia. For the SpotWorld to excel, the huge community is required though. And it would be great if the app has more categories instead of just all spots or popular spots. for example, must-visit travel spots, natural wonders, UNESCO heritage sites, man-made marvels, landmarks and etc. Though itineraries published by travel enthusiasts will most likely cover all the top travel sites, but it would be easier to know which spots are must visit on particular city or country. 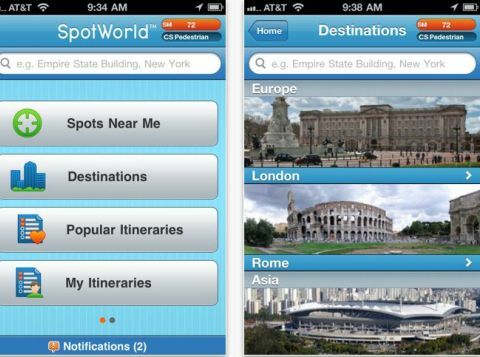 The new easy-to-use SpotWorld social travel mobile app is available as a free download from the iTunes App Store.